Ryder films are screened in several venues, each of which has its own peculiar charms. The IU Fine Arts Theaters are at 1201 East 7th Street, on the north side of Showalter Fountain, next to the IU Auditorium. If you are standing in the middle of the fountain, facing the IU Auditorium, the Fine Arts Building is on your left. The picture above shows the IU Auditorium on the right and the Fine Arts building on the left. The viewing experience at Fine Arts is similar to that of a traditional theater – reasonably comfortable theater seats on a sloped floor. There are two screening rooms – the downstairs theater seats 250, the smaller, more intimate upstairs theater seats 99. This semester, unless otherwise indicated, we are screening in the upstairs theater. To reach the screening rooms enter the IU Fine Arts building through the second floor doors off of the circular drive. Look to your left and you’ll see the upstairs Fine Arts theater. To reach the downstairs theater go to the end of the hall and walk down the stairs. You’ll find the downstairs theater on your right. The Woodburn Hall Theater (WH 101) is at 1100 East 7th St on the Indiana University campus, next to the Lilly Library. 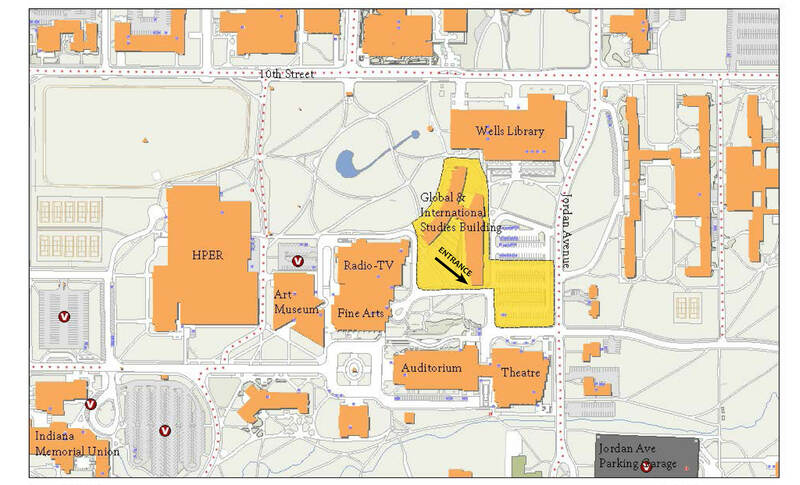 If you are standing in the middle of the Showalter Fountain, facing the IU Auditorium, the Lilly Library would be immediately to your right and Woodburn Hall would be next to the Lilly, just to its right. But please don’t make a habit of standing in the middle of Showalter Fountain. On weekends during Ryder films you can park in the Jordan Avenue lot, more or less across the street from the MAC (lower right, shaded in gray). Parking is free and you do not need an IU parking sticker. Just to be clear – this is only during Ryder weekend screenings. If you ever should receive a ticket, just let us know and we will get it expunged from your record, along with any other non-Ryder-related misdemeanors that you may have acquired on your journey through life. Bear’s Place, 1316 E. Third St., (812) 339-3460, is located just west of the corner of Third and Jordan, across from the IU campus. You must be 21 years old and have IDs. You can order food and drinks at Bear’s Place prior to the movie; the ambiance and conviviality at Bear’s is closer to that of a European cabaret. There is a small parking lot behind Bear’s Place which can be accessed off Jordan Avenue.